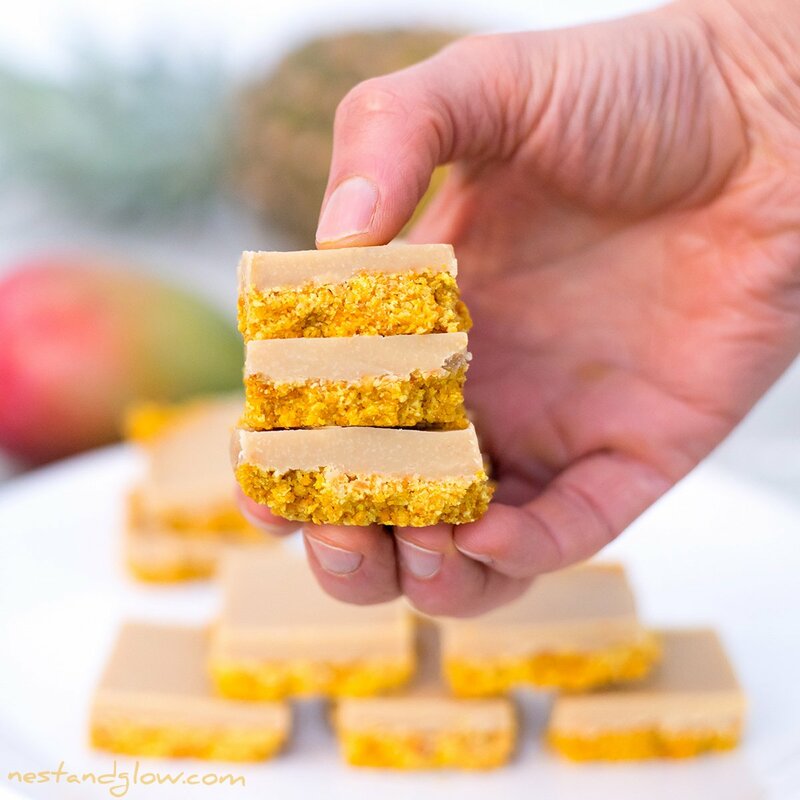 Easy to make healthy fudge made from mango, pineapple, coconut and almonds covered with a creamy dairy-free cashew vanilla topping. The end result is looks and tastes amazing but is still a simple, easy and fun recipe. Suitable for raw vegan, paleo, grain / gluten free diets and general healthy diets. Don’t be put off as it’s a healthy recipe – even if you aren’t interested in eating nutritious food this fudge just tastes great. 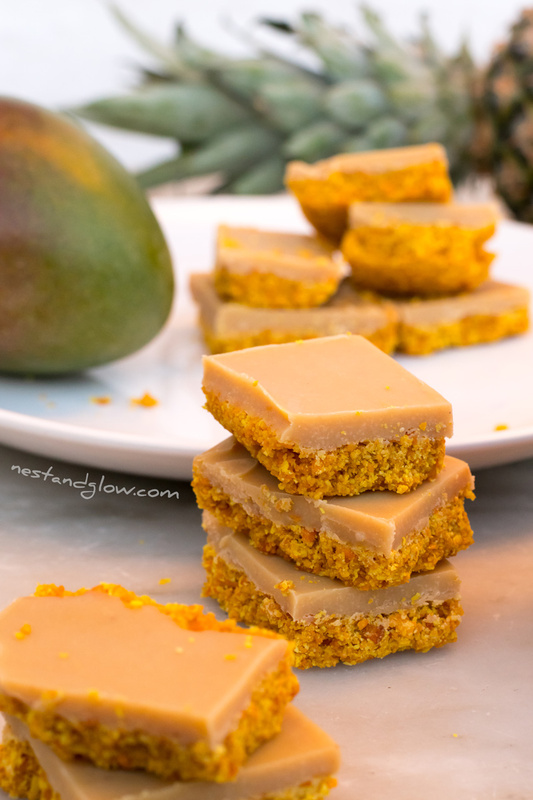 Mango helps to make this fudge an orange colour with a tangy slightly tart lemon-like taste. 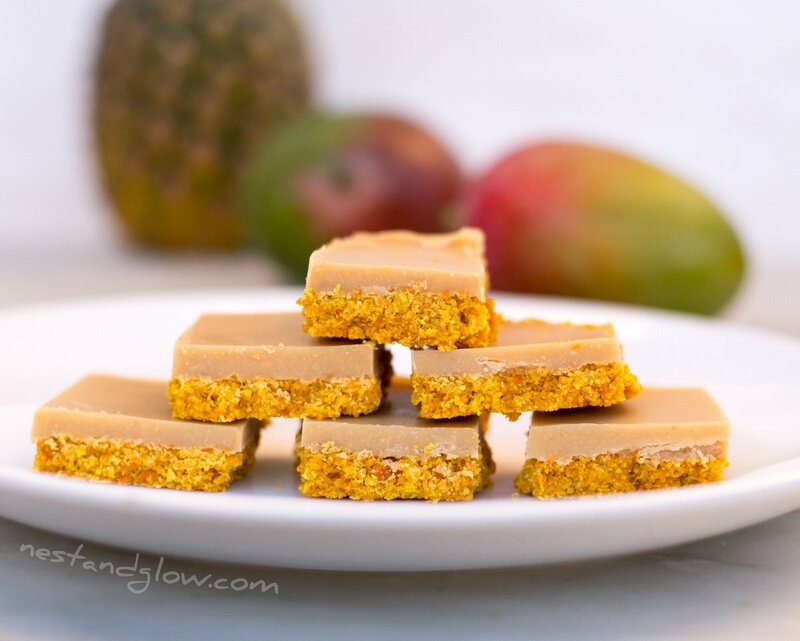 This healthy fudge recipe is mostly sweetened with fruit and contains just a few tbsp of natural sweetener like maple syrup. Natural sweetness of the nuts helps to balance the flavour and make this recipe high in heart-healthy fats and protein. This tastes great and is full of fibre and other good stuff. 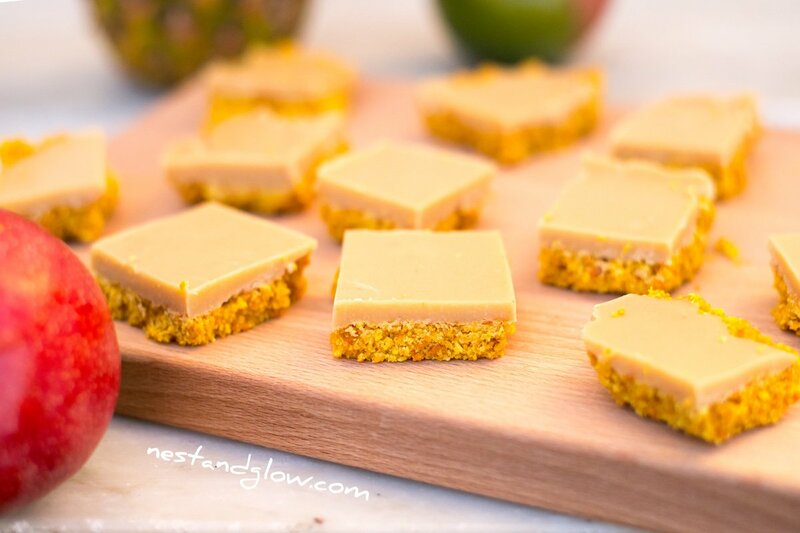 View the FAST Tropical Smoothie Fudge Video Recipe. You can use any nut or seed butter that you like for this recipe. I like to use my own homemade raw cashew butter as the natural sweetness of the cashew nuts means not much sweetener is needed to make a very sweet topping. 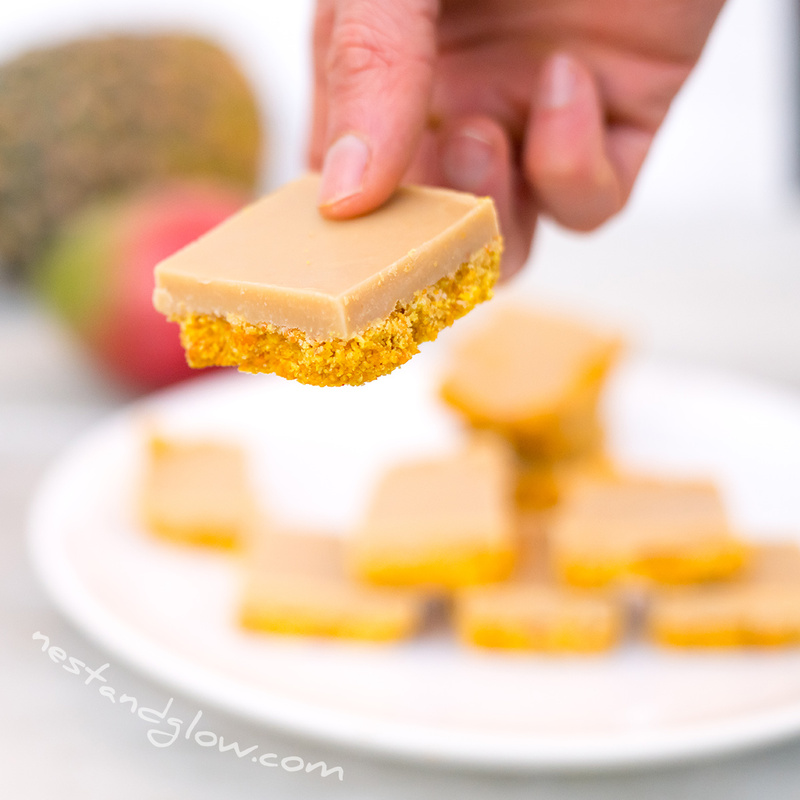 This fudge recipe would work well with normal peanut butter but I would recommend using a pure 100% peanut butter that doesn’t have added salt or palm oil. As with all my recipes adjust the sweetness to your taste. I used maple syrup in this recipe as it’s what I had and is a popular natural sweetener. This did make the topping a bit darker than I would have liked but it tasted amazing. I add a pinch of turmeric to this recipe just to make it a bit brighter. You don’t taste it but it does add some more nutrition. It was only after blending I added it as it wasn’t orange enough for me so added a pinch. I knew the natural cashew topping wouldn’t be a brilliant white so needed a brighter orange base. You don’t have to use pineapple or mango in this but I would recommend using at least one to keep it tropical and replace the other with dried fruit like apricot or raisins. Always use dried fruit that is pure without any added sugar. To make this nut-free replace the almonds with sunflower seeds and the cashew butter with any seed butter like sesame seed AKA tahini. Coconut despite the name is not actually a nut – it’s botanically a seed. Most people with a tree-nut allergy can eat coconut without any problems. Dried fruit counts towards your 10 a day of fruit and vegetables. So just a small amount of this fudge can count towards 3 of your daily portions as nuts also count as 1. I’m often asked how I come up with new recipes and the vast majority I’m just trying to create a healthy plant-based alternative to foods I see. I saw a yoghurt smoothie bar in a shop and didn’t even look at ingredients as I knew it would contain palm oil, sugar, other unhealthy oils and dairy. I like being inspired by a look and trying to create it using only healthy ingredients. Then a few weeks later when there was an offer on dried pineapple and mango I knew it was time to create this recipe. Put all of the fudge ingredients into a blender. Blend for a few minutes until broken up. Line a 8″ pan with greaseproof / parchment paper then push in the fudge to the edges. Doesn’t have to be lined but it makes it easy to turn out. Melt the cacao butter or coconut butter or oil. Mix in the sweetener and nut butter until its combined. Pour over the fudge, spread to the edges and chill for half an hour to set. 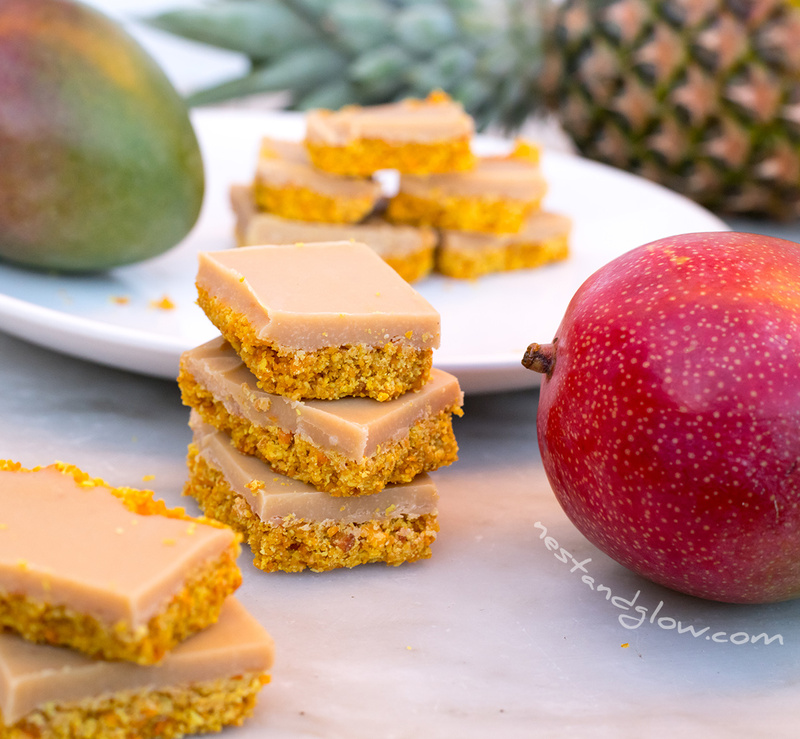 Slice into either squares or bars and enjoy within a week or freeze to last several months.